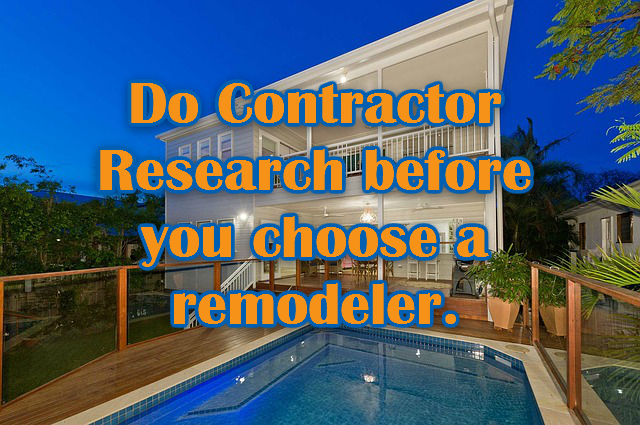 Is it important to conduct research on home remodeling company before you start a remodeling project? The answer to this question is definitely YES. I will explain to you why. It is vital to get a good contractor to work on your remodeling project in Pittsburgh. The only way to find a good contractor for your specific type of project is through research. It is very costly if a home remodeling project goes wrong or doesn’t satisfy your expectations. You may ask yourself, how do people typically research remodeling contractors companies? 1.People often start by checking with friends, neighbors, or co-workers who have used a contractor. Take a look at the work that was done and ask about their experience with the contractor. 3. How long the contractor has been in the business is important to consider also before hiring them. 4.Check out for qualification of the said company, like licensing. Many states require contractors to be legally licensed to carry out their business. If legal requirements are a prerequisite, then make sure before you settle on a particular contractor, and their licenses are current. a) Establish if your project requires a permit. Most home remodeling projects do require at least 1 permit, and a good contractor will advise you appropriately. b) Request a cost estimate from all of the contractors you are considering. This will give you options to choose from based on your budget for the project. However, it is important not to automatically settle on the lowest bidder. Make sure they provide as many details as possible in the bid and see how they answer questions about the quote. Before you assume the reasons for costs, we recommend asking questions about variance in pricing from the different companies. See if they answer questions freely or if they get defensive. This could be a good way to discover a red flag before you sign the contract. c) Ask the contractors about similar projects. Make sure they have completed similar projects like the one you want done. Have them describe the home remodeling process for you so you have a clear picture of how you should expect it to go. This also helps verify they can at least tell you the flow of what they would do, and when things would happen so you have a good sense of thier experience. d) Get a few references of clients the contractor has worked for before. This will help you at least determine if the contractor has a few happy clients. If they don’t have at least a few, run for the hills. e)Ensure the remodeling company has insurance. f) Find out if a contractor will use subcontractors on your project or not. g) Finally, you need to understand the financing options that they offer or if you have to get your own financing. As you can see there are a lot of things to consider before hiring a home remodeling company. Without prior knowledge about the contractor’s history, you are more likely to have problems with your project. The contractor may do shoddy work on your home which can be even more costly to redo the project. The Office of Horace Trumbauer provides complete home remodeling services in Pittsburgh and the surrounding area. We are a 4th generation home remodeling company and we are proud to share our work, our process and our long history of excellence. We hope you consider us for your next home remodeling project. I like that you mention asking contractors about what projects they’ve done similar to the one that you’re hiring for. My husband and I want to build a deck on the back of our home, so it’s important to us that we find someone who has expertise in that. It’s good to take the time to compare different contractors until you find the right one for you.